Our weather has suddenly turned cooler and there is definitely a hint of fall in the air. I am loving it and thinking of autumn dinners. This recipe using butternut squash, one of my absolute favorite squashes, swirled with gouda cheese, sounds delicious. (I am hoping my daughter, Cary is reading this, because she is the greatest vegetarian cook, and I will be seeing her next month. hint, hint). SERVE WITH Sautéed mushrooms, braised greens or tomato sauce. I love the idea of topping it with sauteed mushrooms and some lovely kale with garlic as a side dish would be nice. Heat oil in a large, wide and deep, saute pan. Add garlic and crushed red pepper flakes and cook for a minute or two. and to finish off this lovely fall meal, it's apple season so I would suggest apple crisp made with fresh tart apples. I love macintosh. 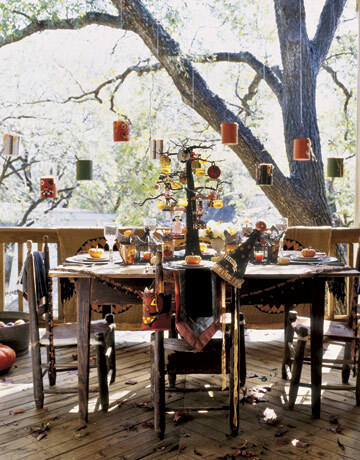 Enjoy in a pretty outdoor spot with a vintage Autumn theme. Outdoor dining is a perfect place for all of those wonderful eclectic thrifting finds. ummmm....yummy!!!! This looks like a recipe after my own <3 :D I love butternut squash, too. Speaking of pumpkin (or should I say butternut squash) Laura, that polenta dish looks amazing. I must try that.